This fresh tuna is a hon-maguro from Ohma in Aomori prefecture in the northern part of Japan. Ohma hon-maguro is considered by many to be the very best specimen of tuna in the world. 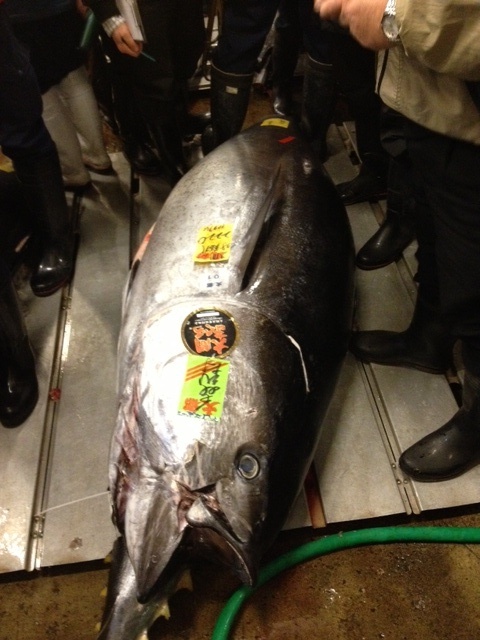 It was sold on Saturday, January 5th, 2013, the first day that Tsukiji Market was open in the new year. this year’s tuna weighed 222 kg. last year’s tuna weighed 269 kg. last year’s tuna was 210,000 JPY per kg. this year’s tuna was 700,000 JPY per kg. Here is the link to the Sushi Zanmai site with photos of the tuna at the store. On Jan. 5th at Tsukiji Market, there was 654 fresh tuna at the auction. On Jan 5th at Tsukiji Market, there were only 4 fresh hon-maguro from Ohma. The other three sold for about 28,000 – 43,000 JPY per kg. The tuna auction is off limits to visitors from Dec. 1 to Jan. 21st. This photo was taken by New Zealander Ken Banwell who is a tuna importer. Ken is one of very few non-Japanese who was at the auction on the morning of January 5th, 2013. Ken graciously shared this photo with us. Ken is the author of a beautiful photo book on Tsukiji Market, The Fish Market. The Fish Market is available at the bookstore at Tsukiji Market Yokocho bookstore and online at this link. The book documents the auction and is all the more valuable as the market is scheduled to move to Toyosu in March of 2015.